There’s a lot we can learn about better ways to interact with the environment from our fellow creatures. 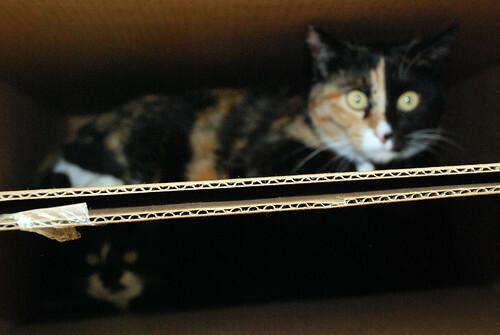 Edo and Pyx, much to our amusement and edification, make it their daily challenge to find new ways to reuse old things. As imaginative and dedicated as they as they are, they can’t hold a candle to Norman. No all food is created equal, and some purchases make us complicit in waste on a massive scale. 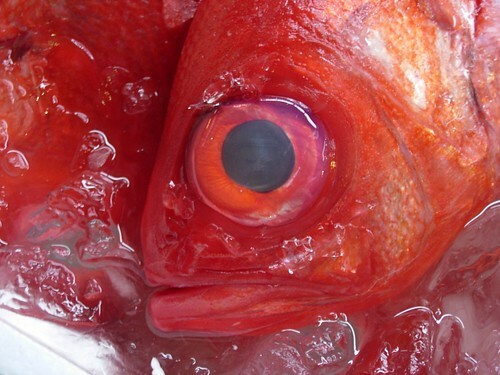 In the world of fisheries, there’s even a word for one aspect of that waste: bycatch. My handy desktop dictionary defines bycatch as, “the unwanted fish and other marine creatures caught during commercial fishing for a different species” – and, as well as fish, it can include such creatures as sea birds, turtles, and dolphins. Often, bycatch is killed in the act of being caught or is thrown back into the sea injured, with diminished chances for survival. The scale of bycatch can be huge. In some shrimp fisheries, there are about six pounds of bycatch for every pound of shrimp caught. Fortunately, that isn’t true of all fishing, or even of all shrimp fishing. Unfortunately, you need practically encyclopedic knowledge of ocean species, their habitats, and fishing and farming practices just to buy a piece of fish responsibly. That’s why I was happy to discover Seafood Watch last year. This Monterey Bay Aquarium initiative has developed several free tools that let anyone quickly look up any fish, and see if it is abundant, well-managed and sourced in an environmentally friendly way – and that provide alternatives to consider if it isn’t. The information is available on-line, as well as through free applications for both the Android and iPhone platforms. The mobile versions have a social dimension, and allow you to find & share the names of local businesses that have environmentally friendly options. 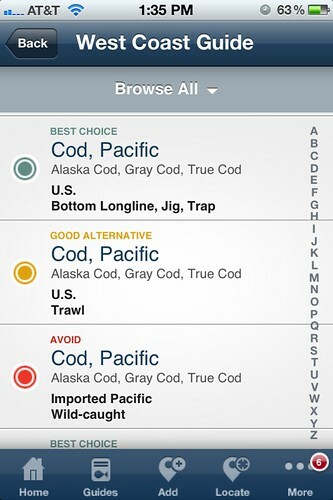 If you don’t have a smart phone, you can print the Seafood Watch pocket guide from their site, and carry that with you when you go shopping, or out for sushi.